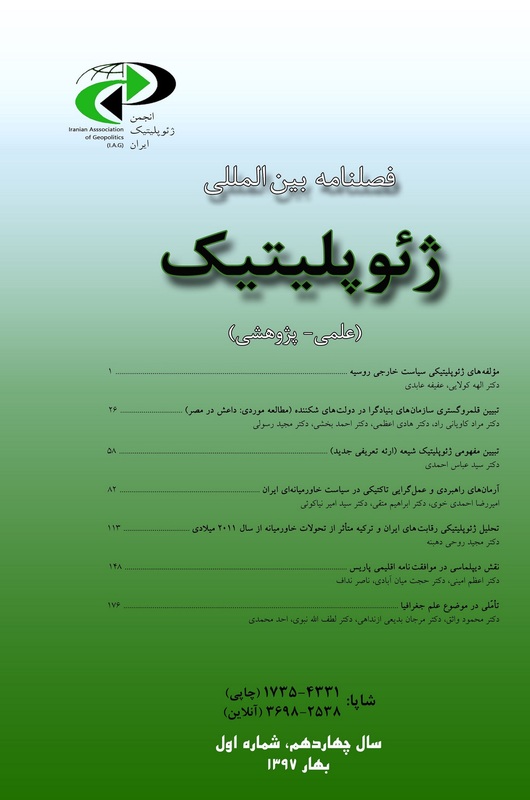 amini, اعظم, میان آبادی, حجت, نداف, ناصر. (1397). نقش دیپلماسی در موافقت‌نامه اقلیمی پاریس. فصلنامه بین المللی ژئوپلیتیک, 14(49), 148-175. اعظم amini; حجت میان آبادی; ناصر نداف. "نقش دیپلماسی در موافقت‌نامه اقلیمی پاریس". فصلنامه بین المللی ژئوپلیتیک, 14, 49, 1397, 148-175.
amini, اعظم, میان آبادی, حجت, نداف, ناصر. (1397). 'نقش دیپلماسی در موافقت‌نامه اقلیمی پاریس', فصلنامه بین المللی ژئوپلیتیک, 14(49), pp. 148-175.
amini, اعظم, میان آبادی, حجت, نداف, ناصر. نقش دیپلماسی در موافقت‌نامه اقلیمی پاریس. فصلنامه بین المللی ژئوپلیتیک, 1397; 14(49): 148-175. امنیت زیست­محیطی بخش مهمی از امنیت ملی و انسانی است. با توجه به چالش­های موجود و پیش­رو در مسایل زیست­محیطی در دنیا، گزینش رویکردی جامع و پایدار به مقوله امنیت زیست­محیطی ضروری است. حل چالش­های ایجاد شده محیط­زیستی نیازمند همکاری­های بین­المللی برای بهره­بردای منصفانه و منطقی کشورها از منابع طبیعی بدون آسیب­رسانی به کشورهای دیگراست. این مسئله نیازمند نوعی ایده­آل از دیپلماسی است که تعاملی مثبت با تمامی طرف­های ذی­مدخل داشته و به همکاری و مشارکت گروهی با در نظر گرفتن منافع منصفانه و منطقی منطقه­ای و جهانی منجر شود به گونه­ای که منافع و امنیت ملی کشورها همسو با منافع و امنیت جهانی تأمین گردد. موافقت‌نامه اقلیمی پاریس محصول دیپلماسی چندجانبه و فرایند طولانی مدت مذاکراتی است که از سال 2007 در بالی آغاز شد و در دسامبر 2015 در پاریس تصویب شد. هر چند این موافقت‌نامه تمایز میان کشورها و واقعیات مربوط به درجه توسعه یافتگی آنها را می­پذیرد اما مرزبندی­های مزبور را درنوردیده و تعهدات مشترکی را در خصوص کاهش انتشار، انطباق و شفافیت برای همه کشورها ایجاد می­کند. دستیابی به یک توافق تازه حقوقی، هم از نظر سیاسی و هم از نظر فنی بسیار دشوار بود و این مهم حاصل نشد مگر با مذاکرات متعدد که در طی چند سال صورت گرفت و در پاریس به ثمر نشست. هدف از این مقاله، بررسی تأثیر دیپلماسی در شکل­گیری موافقت‌نامه اقلیمی پاریس است که در آن چالش­های متعدد دستیبابی به این موافقت‌نامه بین­المللی را در ابعاد مختلف ساختاری، حقوقی، مالی، تعهدات و محتوای آن بررسی و واکاوی می­کند. نتایج نشان می­دهد که دیپلماسی­های فعال زیست­محیطی، چگونه نقش پررنگ و اثرگذاری در تعیین محتوا و ساختارهای مختلف این موافقت‌نامه در فرآیند مذاکرات داشته است. The Paris Agreement is the result of multilateral diplomacy and long-term process of negotiation started in 2007 and released with the approval of the treaty in accordance with international law in Paris by 2015. Reducing the temperature below 2°C and convincing developing countries to accept emission reduction commitments was a major challenge to climate change. A fundamental revision on climate change regime happened in the Paris agreement and it moved from hard distinction approach on emission reduction commitments in the Kyoto Protocol towards a more global and comprehensive approach. By a descriptive and analytical way as well as the study of papers and documents, the first section presents the process of formation of the Paris agreement and its framework and the principles governing it. The second section examines the main results that arise in the negotiating space and analyzes its achievements. The Paris Agreement is the result of a compromise between, on the one hand, the Europe and several developing countries looking for a legally binding treaty, and on the other hand, the U.S. who was insistent to achieve an outcome that did not require the approval of the Senate, as well as China and India, who insisted no new commitments should be imposed on developing countries. The “intended nationally determined contributions” (INDC) was introduced at COP19 held in Warsaw in November 2013. INDC and the use of the term "measures" instead of "commitment" had significant role in leading to the 2015 Paris Agreement. The EU’s strict stance in support of 1.5°C temperature and separation the poorer developing countries from the large emerging economy countries motivated by negotiation tactics, resulted in changes in positions and reaching a consensus on below 2°C. There are different types of commitments in this agreement and the scope of members’ obligations depend on their interpretation of terms in each article. INDCs are different with respect to the internal situation for each country. The agreement structure is continuous and long-term and nations shall gather every five years and represent their collective progress and reduction plans. They should update these measures, and the members have no right to reverse their previous actions. It should be stressed on financial mechanism that in spite of reaching consensus on $100 billion annual aid from 2020 for developing nations to address climate change issues, in which was recognized in the Copenhagen Agreement (COP15), the text of the Paris agreement has not mentioned any assistance and what has finally been approved does not require any assistance. In this agreement, the concept of damage was identified and strengthened in the agreements, but with the efforts of the United States and other developed countries, it was forbidden to bring liability proceedings to compensate for it. The Paris Agreement is the result of twenty-five years of global negotiations on combating climate change. Even though it establishes common commitments for all nations, it is based on the principle of common but differentiated responsibility. In this agreement, although members are obliged to fulfill their commitments, these commitments are determined by varying domestic and internal circumstances. Although the purpose of this agreement is to minimize greenhouse gas emissions, it will take longer time for developing countries. The Paris Agreement is the result of 25 years of UN negotiations in the fight against climate change. Even though it establishes common commitments for all nations, it is based on the principle of common but differentiated responsibility. In this agreement, however, nations are obliged to fulfill their commitments, but these commitments are determined in internal scale and with respect to different internal situations. Although the purpose of this agreement is to minimize greenhouse gas emissions, it takes longer time for developing countries.